The SuperGoldCard patches are wrong: I’ve analyzed all the patches and they all look fine. In fact the patch code is identical to Minerva’s code except for the timing loops. Still, it appeared to work with earlier versions of the patches, which makes it weird again. Personally I couldn’t care less if Microdrives work or not and the fact that this bug was not discovered for so long strongly implies that most other people also don’t use Microdrives with SGC systems anymore. Still I have trouble resisting a good puzzle so I had a look. And then another one. And then ten more because this was a very elusive bug. The problem is that not only is the bug located in ROM locations that are hard to debug anyway, the MDV code is so time critical that it’s impossible to step through the code. So how can one debug this? Hardware to the rescue! The SuperGoldCard very conveniently has a parallel port on board that can be accessed very simply by the software. By connecting a logic analyzer to all 8 data lines and sprinkling output commandos throughout the MDV code I can get a live trace of what the code is doing or output the contents of registers byte-by-byte. cmp.b   lstblok(a0),d7  is it the last file block? add.l   d7,d7           is it the first file block? The “ror.l #2,d0” is a pretty clever way to both divide the register by 4 (because the copy loop does long words) while still remembering the odd bytes that also need to be copied. But it relies on one thing: that bits 16 and 17 of the register are zero. 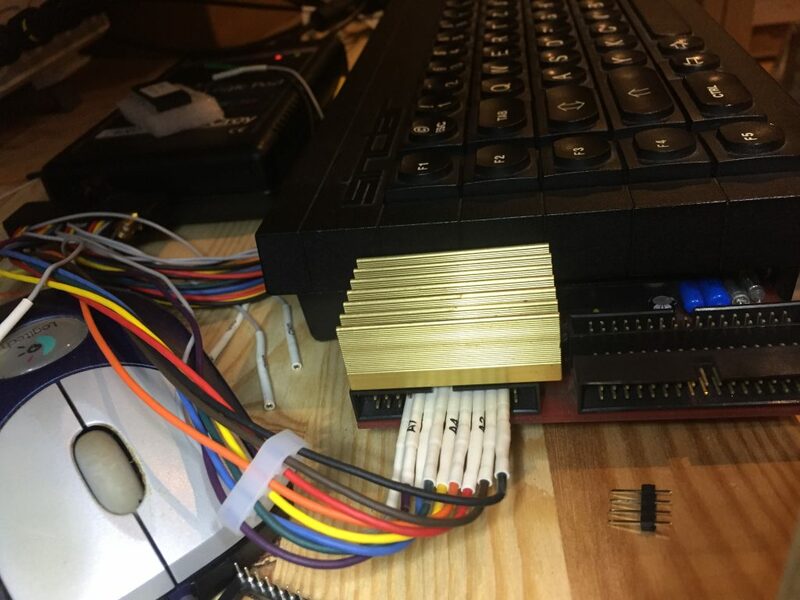 These bits are shifted into the lower 16-bits and are then used by the dbra instruction, which means that if they are set instead of copying 128 long words it will copy at least 16384. Talk about a buffer overflow! I guess everybody can see the difference now, the original code clears the upper word of D0 and the replacement code does not. And as it happens the upper word is $FFFF from an earlier call to md_slave. All in all a very subtle difference, hard to spot by just looking at the code. The solution I chose is it to exchange the “move.w #blksize,d0” line with “move.l”. That adds two bytes (every byte is precious in Minerva, there are not many left! ), but this is the minimum I can get away with without relying on side effects of outside code, which is how this bug was introduced in the first place. As this is the second fix from me for Minerva 1.98 I will have to think about how to mark these modified Minerva versions as increasing the version number is a no-go unfortunately. 1.99 is the last number we can use in theory before running into extended compatibility problems and I’m not even sure about this, 1.98 is still a safer choice. Anyway, I hope this was interesting to read, leave a comment if you want. I will soon release a fixed binary version. QDOS boots normally, finds 128kb of RAM (because of the ROM) and executes the GC BOOT code at address $C000. This in turn initialises the hardware, copies and patches QDOS to RAM, copies parts of the GC ROM to RAM and finally issues another reset. This is why on the GoldCard the QL always boots two times. Fun-fact: the GoldCard can boot without any firmware ROM, this makes it somewhat possible to inspect the above memory layout live. In this case the SGC ROM doubles as the boot ROM and gets executed immediately. This is why the SGC does not need to double-boot. Again QDOS is copied and patched and parts of the SGC ROM are copied, too. Unlike with the GC, the copies of the SGC ROM are write protected. The (Super)GoldCard does not have any kind of RAM that survives without power but still can store a bit of configuration like if F1 should be automatically pressed on boot. Well, how can this be? This was some mayor kind of “heureka” effect while analyzing the code. The cards contain a realtime clock chip that does not possess any additional RAM either, but it has a register that controls the interrupt line. The interrupt is never used on the golden cards, so the firmware just (ab-)uses the 4-bits available to store the configuration! Really clever. The topic of what kind of patching the cards do on boot is almost mythical and was basically the reason I started this in the first place. All patches have been decoded and commented and everybody can look at them now (download below). There are a few patches that remove the most common bugs from the original QDOS ROM and a lot more that are applied to every ROM including Minerva. In some cases bugs in Minerva have been patched, but in these cases they have also been fixed in Minerva, so they usually don’t get applied anymore. One huge part is replacement of the MDV, network and I2C code, as these are all very timing critical. Most remaining patches are exclusive to SGC because of the added code cache handling and the difference in exception frames of the 68020 to the 68000. Also there is an emulator for the “MOVE SR,x” instruction that became privileged on later processors. Quite many of the patches actually alter QDOS for use with a graphics card with more resolution. At first I thought this was somehow connected to the Aurora and wondered why the condition for their activation apparently could never be true. But then I saw that Aurora’s VRAM starts at $4C0000 and the patches are all for VRAM that starts at $4E0000. The only explanation is that this is all for Miracle Systems never release Masterpiece graphics card. They must have been pretty well along the development path if these patches all made their way into the default ROM already. It even goes so far as to patch PTR_GEN after it is loaded. The interesting thing about this is that the patches could easily be altered to work with the Aurora. As I don’t own an Aurora this is not for me to do, however. Finally here is the source code for all to see. For this version it was important to me that the result is bit-identical to the original source code, even though I had a strong urge to to change some code along the way… The result is not completely bit-identical to the GC2.49 ROM, but mostly because the utility libraries have changed. I have verified that the patches are exactly the same. I will also submit the changes to Wolfgang to incorporate back into the SMSQ/E source code.